Our summer has been pretty hot, I am not complaining, it’s been great ! And nothing is better than having a bowl of ice cream on a hot summer day…..and it’s homemade ! Blueberries are in season, so why not make good use of them ! This recipe is really simple, yet flavourful. No kidding, it’s probably the best ice cream I have ever made ! It looks amazing too ! I am so glad I bought the ice cream machine, trust me, it’s totally worth it ! Oh, here are some extra tips ……. Hope you will give this a try and have a great summer ! This entry was posted in Ice Cream and other frozen treats and tagged blueberries, blueberry cheesecake, blueberry cheesecake ice cream, blueberry ice cream, cream cheese, desserts, fbcigers, food blog, food blogger, ice cream, ice cream recipe, recipes, summer, summer desserts, summer treats on July 19, 2018 by tinysweettooth. Oreos! One of kids’ favourite cookies! Actually they are one of my favourites too. They are super yummy and they make great desserts like these little cookies and cream cups. Great easy idea for pot luck or kids’ parties ! And I think they would taste extra yummy when the weather is so warm and nice ! This entry was posted in Ice Cream and other frozen treats, Other desserts and treats and tagged cookies and cream, cream cheese, dessert recipes, desserts, food, frozen desserts, oreo, oreo desserts, oreos, recipes on June 4, 2016 by tinysweettooth. Last Sunday, I made this Japanese cheesecake with my daughter. It turned out very nice. It has a lighter taste and a softer texture than a regular cheesecake, but is still very creamy. The special ingredient ? ……. Meringue ! It allows more air to be incorporated into the cake batter and hence, a fluffy cake. So if you find regular cheesecake too heavy, this may just be right. By the way, you can now “yum” my recipes on Yummly if you have an account. Just click the Yummly button under each recipe. Thanks in advance ! Turn oven off, leave oven door ajar for about 20 minutes before taking cake out. This will prevent cake from shrinking too much due to sudden drop in temperature. A slight shrinkage is normal. 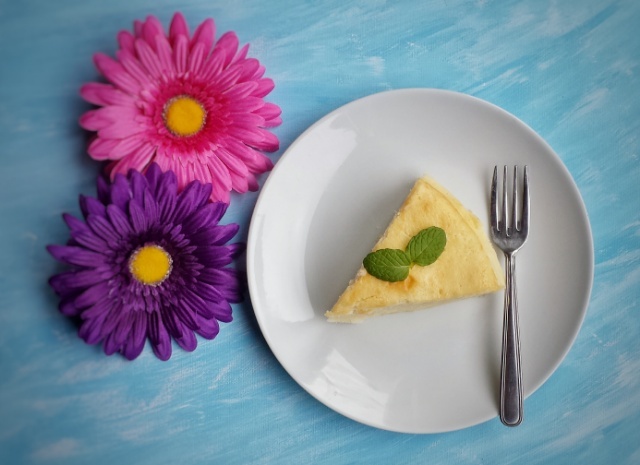 This entry was posted in Cakes and Muffins, Spring/Easter and tagged baking, cakes, cheesecake, cheesecake recipes, cheesecakes, cream cheese, food, Japanese cheesecake, love baking, recipes on February 28, 2016 by tinysweettooth.